Stheno is a Gorgon, an immortal monster from the old world of Olympus, infamous for having serpents for hair and the ability to turn prey to stone with a petrifying stare. With her sister Eurayle, the only other Gorgon ever born, they lived in a desolate land far to the north. Long ago they witnessed Poseidon assaulting a priestess named Medusa in Athena’s temple. When Athena arrived, enraged by the desecration of her temple, Poseidon accused Medusa of seducing him. When Stheno and Eurayle attempted to defend her, Athena took the word of Poseidon over the Gorgons, and cursed Medusa to become one of them. 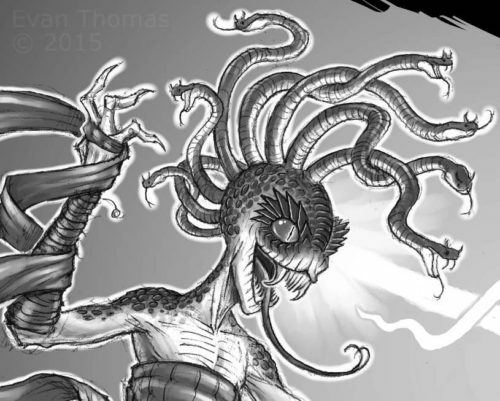 Twisted and deformed into the shape of a Gorgon, Medusa fell into despair. The two sisters took pity on her, and adopted her as one of their own. Though they lived in the far lands for many years together, Medusa was slain by the hero Perseus, who used her severed head as a weapon to defeat the Kraken. Afterwards, Athena claimed Medusa’s head for herself and mounted it onto her shield. When the conspiracy to overthrow Olympus was set into motion, Stheno and Eurayle agreed to join under one condition: that Athena and Poseidon would be theirs to destroy. When the world of Olympus was destroyed, only Stheno, her siblings, and a handful of other creatures survived. As the new world grew and evolved, Stheno grew bored and jaded with her immortality. She and Eurayle drifted apart, and Stheno wandered the new earth aimlessly, searching for new meaning. 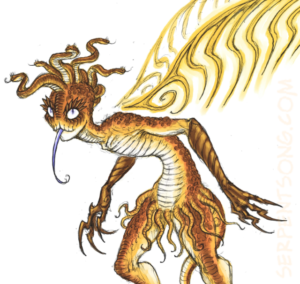 To move unnoticed through the land, Stheno keeps her serpentine hair and wings hidden by turbans and clothing. She also uses her petrifying stare sparingly, as she has learned that it attracts unwanted attention. Over the years, Stheno has developed a ghoulish sense of humor, and rarely takes anything seriously. Her agelessness has worn on her mentally, and she often forgets long stretches of time. She becomes bored with things very easily, and even the direst situations can only keep her interested for a short while. After so many centuries of wandering, she is desperate to find things that can surprise and entertain her. Luckily she runs across Chuz, whose clumsy criminal antics have become her new favorite distraction.